Rebecca Sive | This site shares information about my work as an author and advocate for women. “The gift of a woman president”can be yours: I am so pleased that the audio version of Vote Her In is here. Glowingly reviewed by the Chicago Tribune, Vote Her In is an inspirational, graphic-driven, and practical guide that explains why we should elect Madam President in 2020, and how every woman can take part in achieving that success and benefit from it. The #VoteHerIn podcast explores all this. I’m excited to have launched this new project with @TwoBroadsTalkingPolitics: click this link to sign-up. Here is the latest episode. Check out this playlist of interviews from bSMART. The Daily Beast recommends“nine books to read to get ready for the pink wave” of 2019: Every Day Is Election Day: A Woman’s Guide is one. “Our favorite author,” that would be yours’-truly, is here in a YWCA Facebook Live show. And here is a talk I gave to a group of business leaders about the need for women to be in every c-suite. Later, I was told “you were brillant,” after a radio show in which I discussed women’s leadership. Here, the Chicago Sun-Times makes the case. 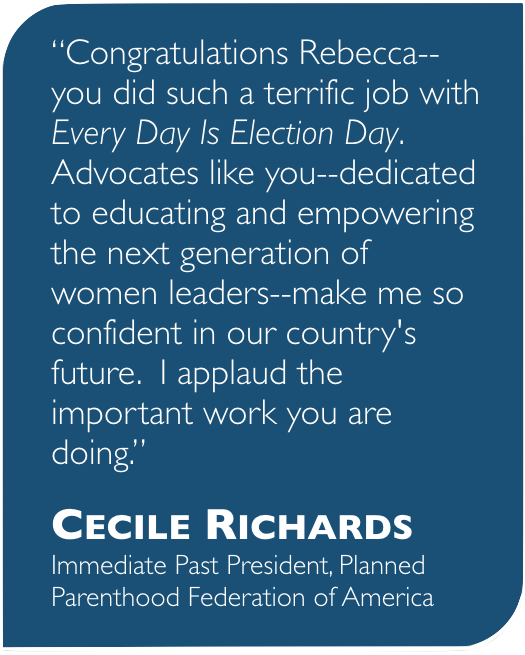 I also speak about women’s leadership and power and wrote Every Day Is Election Day: A Woman’s Guide to Winning Any Office, from the PTA to the White House, a frank exposition on women’s importance in the public square and at every decision making table. The image below is from an event where I joined American hero and civil rights leader, Dolores Huerta, and Alicia Garza, co-founder of Black Lives Matter. More on my #GirlPolitics work on the pages that follow.